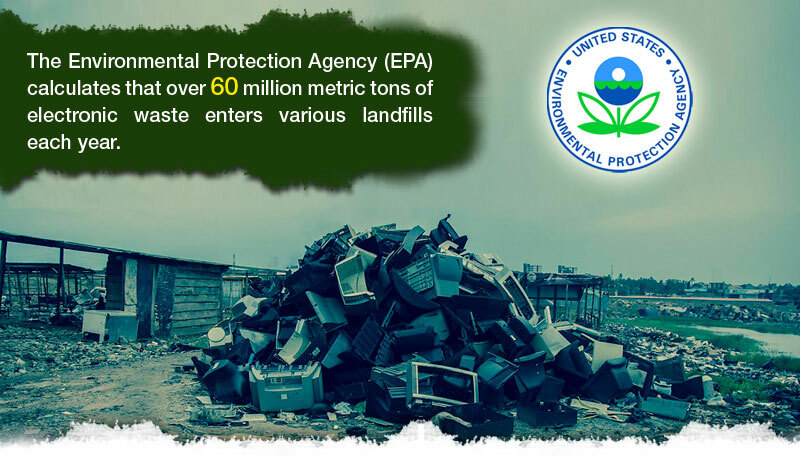 The Environmental Protection Agency (EPA) estimates that over 60 million tons of electronic waste is dumped in landfills every year. In Agbogbloshie, Ghana one of the world’s largest e-waste burial grounds houses thousands of tons of electronics. The soil is a breeding ground for lead poisoning. Children as young as seven years-old sort through this waste on a daily basis, causing chronic health problems and crippling injuries. See the infographic below for an in-depth look at this devastating epidemic. Graphic courtesy Ecogreen IT Recycling. The Environmental Protection Agency (EPA) estimates that over 60 million tons of electronic waste is dumped in landfills every year. In Agbogbloshie, Ghana one of the world's largest e-waste burial grounds houses thousands of tons of electronics. The soil is a breeding ground for lead poisoning. Children as young as seven years-old sort through this waste on a daily basis, causing chronic health problems and crippling injuries. See the infographic below for an in-depth look at this devastating epidemic.